Grandparents have watched the littlest ones learn to ski and cousins have become true friends as secrets are shared on the slopes. These are the kinds of traditions that bring families closer together at Element 52. We help make memories, beginning with our open-hearted welcome and our exceptional location surrounded by Colorado’s iconic peaks. Our venues and accommodations give you space to connect with each other—whether you’re planning a family reunion, milestone anniversary, intimate retreat or other celebrations. Elevate your next meeting or event with thousands of square feet of indoor and outdoor space that exude mountain spirit and natural elegance. Gather your family, typically scattered across the globe the rest of the year, for an unforgettable reunion celebration in our largest, most exclusive residence, with its open-plan entertaining area and expansive outdoor terraces. Or for an intimate executive retreat, our five-bedroom residences combine phenomenal space with breathtaking views of iconic 14,000-foot peaks. In summer, our Ski Concierge turns into a private sanctuary for banquet-style breakfasts, intimate meetings and executive retreats. We can arrange outside vendors to work with you on custom themed menus that incorporate the best of what’s in season on the Western Slope. Our professional staff can help with any technical requirements, from a state-of-the-art speaker system for your reception to modern audio-visual capabilities to enhance any meeting. Our specialists can arrange everything from a live instrumental band to a DJ set up. We have house-made and mountain lifestyle designed amenities for purchase. Adventures the whole family can enjoy include hiking to cascading waterfalls and dog sledding through snowy Colorado backcountry. 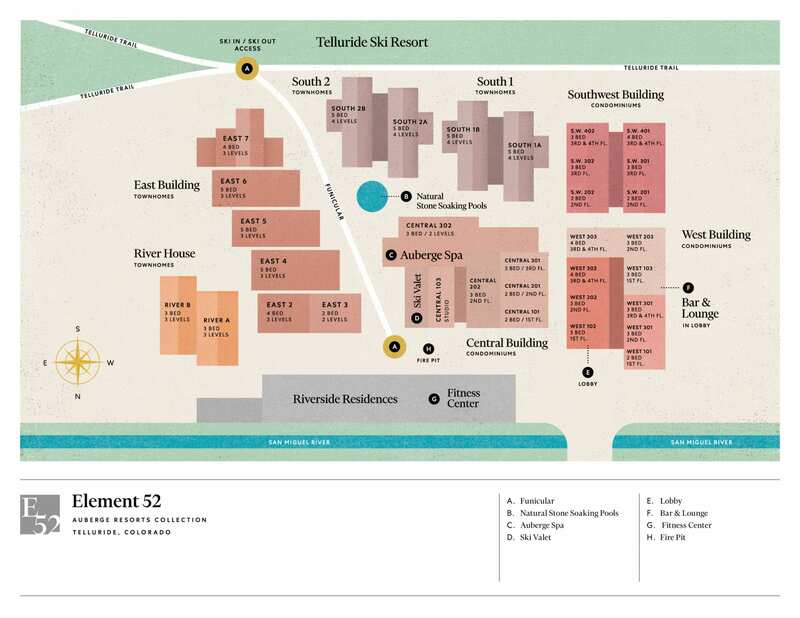 Our prime Telluride setting, with ski-in, ski-out access, and steps from the heart of historic downtown, lets you connect and revel in each other’s company in true Colorado style. An al fresco cocktail party is always nice. An al fresco cocktail party on your own private terrace overlooking the San Juan Mountains is extraordinary. Go big on your next milestone birthday. Dramatic mountain homes coupled with endless outdoor adventure excursions, including heli-skiing to whitewater rafting, take team building and bonding to the next level. Book three consecutive nights and enjoy the fourth night on us to make even more epic memories. With ski-in, ski-out access to 1,700 acres of diverse skiable terrain at America’s best Alpine ski resort and backcountry adventures just steps away, the choices for outdoor adventure are endless. “Telluride really is a skier’s mountain,” says renowned ski-maker Pete Wagner. “Great terrain, and there’s never anyone on it.” 148 ski trails at America’s best Alpine resort and more beckon. Plan and book your stay eight or more days ahead and enjoy 10% savings when paid in full (non-refundable).